Ahmedabad-based andblack design studio is a fan of symmetry, fluidity and minimalism. The firm’s projects celebrate space, nature and innovation without relying too much on bombastic props. Ahmedabad-based andblack design studio loves minimalist but sturdy styles with an edge. 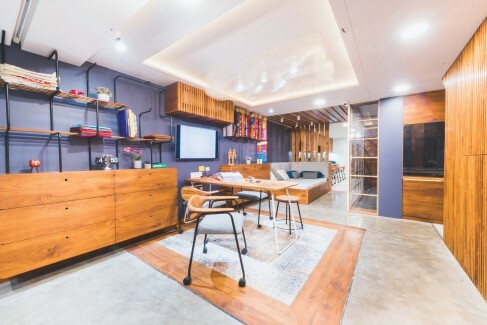 Be it a cramped office space or a luxurious home, the team is capable of infusing a distinct character not just to the entire project but to every section within the project as well. Kanika and Jwalant Mahadevwala lead the way and help feed a reliance on physical modelling and use of parametric tools to realise interiors, architectural projects, installations and furniture pieces that are memorably beautiful and innovative. The preferred layout scheme is fluid, with the outside never too much of a shut-off element. “We tend to use materials like metal, wood, bamboo, paper, etc., in ways that haven’t been explored generally in the larger context of design in India,” adds the team. The following three projects can testify to that principle. Modern offices tend to invest in individuality nowadays. It is not enough to be utilitarian, and it is so yesteryear to be recklessly thematic. Today’s workspaces do not shy away from eccentricity or fluidity, and encourage their occupiers to be free-thinkers. The Abhishek Goyal Office is no exception. The andblack team was clear about the minimalist template to be put to use here; it had to aid the inside-outside scheme well, too. 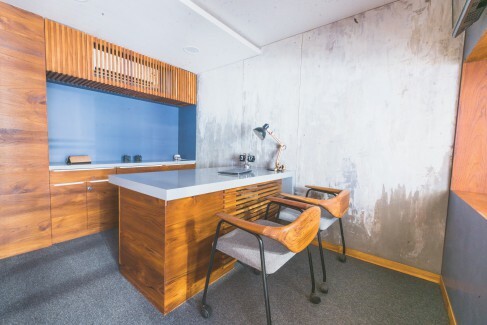 “Sophisticated, inspiring and contemporary were the adjectives we were after while designing this office,” states the team. 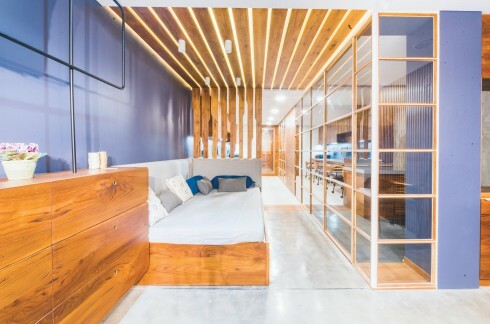 This translated into a breathy expanse of carefully divided spaces that are dominated by bright polished wood and beautiful pattern breakers. “The grey and wood coupled with sleek black metal and white was the mood,” the team confirms. The primary challenge was the tight space, a factor that the team circumvented by a furniture spread of sleek, low-rising pieces, and shelving that apes industrial piping. Wide glass doors and windows make sure that the cubicles don’t seem stuffy and out-of-bounds, and that natural light is plenty in supply. 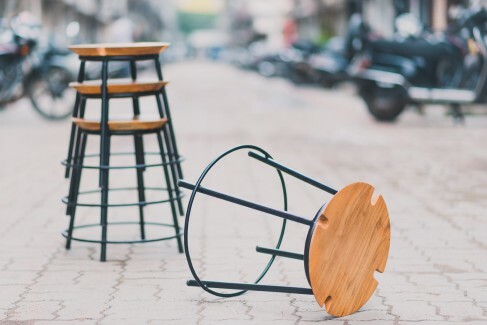 The natural pattern of the wood is a fascinating element of the look of the place – it makes everything from the chairs, stools, tables, and the mullioned screens and dividers look self-assured and fashionable with zero frills having been added. Other clinchers include the spots of highly-patterned and colourful tiling. They pop up on a wall, or on the floor, and seem to make your eyes readjust. 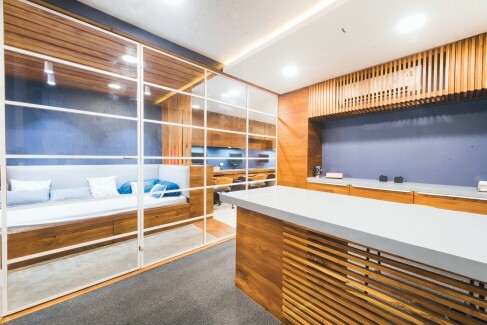 Admittedly, the clients and the designers share a love for generous spreads of wood, and for brass, and the office that has come to be represents that aesthetic perfectly. “It is one of our projects where we would like to stay ourselves,” states the team, and that statement itself can stand as testimony to the unbuilt project’s brilliance. Expansive and designed to be a “long house”, the central concept repeats the team’s predilection towards an in-and-out scheme. The spaces are designed so that the interiors and the exterior do not seem too disconnected and are separated only by easily-accessible barriers. “All the day living spaces are arranged along a long openable wooden screen.” When these screens open, torrents of sunlight and the beauteous views of a series of courtyards rush in. 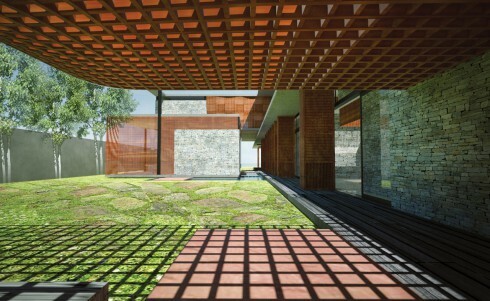 The courtyards, too, are not uniform, and instead flaunt unique characters that include the classic tree-at-the-centre look, a grass-and-stone-slabs model, as well as a small water-body that is pebbled at the floor and bridged to the multiple mini-decks around it. 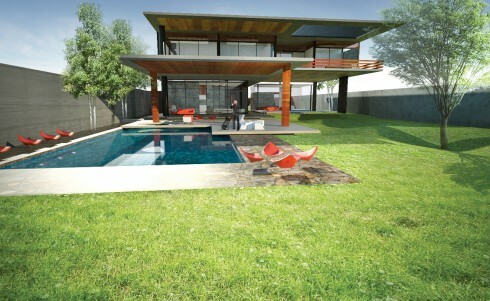 It is a fun set-up this, with sections of the house changing personalities and even elevations at regular intervals. A river runs by the site so, naturally, the cosiest sections of the home are arranged to make the most of this view. The bedrooms and other private segments sit on a deck-like structure atop the elongated public section, ensuring a complete cut off for the residents when required. 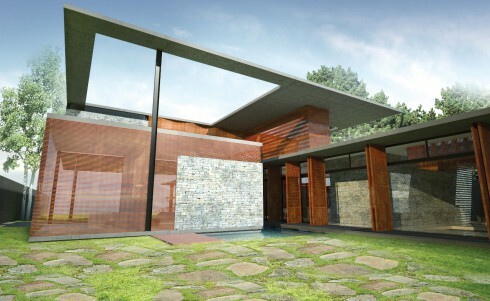 This project, luxurious and created to inspire uninterrupted interest, can easily become an andblack totem. 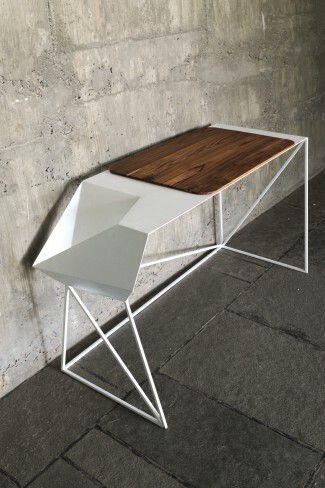 andblack’s furniture line has a sharp eye for geometry and an affinity for minimalism. 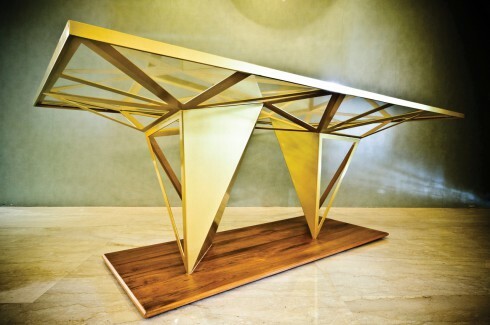 It is impossible to start this conversation without mentioning the ‘Edge Table’ straight up! 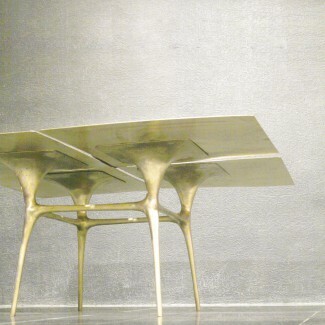 This mighty extra-terrestrial is a glass-topped dining table created out of contiguous light-weight, golden, folded metal sheets. The beautiful origami here realises a branched support on the top to support the glass, and tapers down to quadrilaterals, with their pointy edges standing on a polished wooden slab. This piece is two-legged unlike the conventional four-legged ones, and is resplendent and memorable to boot. The ‘Crossover Chair’ proves that simple is beautiful. 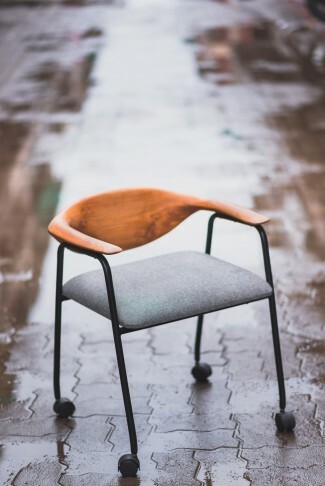 A concrete grey slab-like cushioned seat sits wedged between a slanting turquoise back and a sturdy straight wooden armrest and forelegs. The colour shift that happens at the shoulder is quaintly fascinating here. Other interesting beings in this collection are the ‘Poise Tables’, capable as a troika of looking like an Oriental chandelier, though from the floor up! The circular wooden tops here are held up by metal legs designed to form a geometric pattern. Our attention is now drawn to the superbly sleek ‘Folded Table’, which has a white gleaming top that looks like folded paper at one end. The other end sports a smooth patch of wood, perfectly placed to hold some fashionable showpieces or reading material. 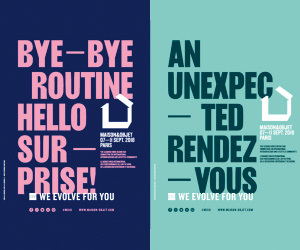 The design team at andblack loves to combine bendy eccentricity with straightforwardness, sometimes juxtaposing them at opposing ends. This furniture line loves to work that ethic unabashedly!